If you haven't already, please connect us to your social media contacts. 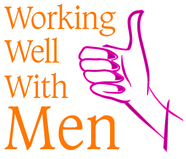 Please get in touch whenever you see a Working Well With Men product or service that interests you. We’ll do whatever we can to help you make sure men give and get all the love they can.